The bravery and quick-thinking of a neighbour and a caretaker saved the life of Jamnian Jitawanit (89), when the storage area of her house in Saraphi caught fire July 26. The flames spread quickly through the old wooden house, destroying one story and causing extensive damage to neighbouring houses as well. Benjamat Ngamta, (59), the caretaker of Jamnian’s house and another neighbour had both rushed when they discovered the fire to help the disabled woman to safety. Police and 10 fire engines attended within minutes; the fire was under control within 15 minutes, but not before it had caused 200,000 baht’s worth of damage to the three houses. Police and volunteer rescuers directed local traffic away from the danger area. An initial examination of the seat of the fire suggested that an electrical short-circuit may have been the cause. Benjamat also stated that the power circuits in the wooden house were very old, and that various electrical equipment, including a fridge freezer and a TV, were in regular use. Forensic experts will further examine the seat of the fire and the state of the wiring in the house in order to come to a definite conclusion. Deputy Minister of Public Health Visanu, pictured exchanging greetings with concerned Chormthorn district residents. An alarming report from the Chiang Mai Public Health office concerning the number of Streptococcus Suis viral infections treated at Chiang Mai hospitals during the first half of 2008 has resulted in a visit to the city by the Deputy Health Minister, Visanu Menachainant. Since the beginning of the year, 51 people have been infected by the virus, which is endemic in the Northern provinces; 5 have died as a result. The disease is contracted by eating uncooked pork and drinking pork blood, and can be fatal, causing toxic shock syndrome, meningitis, septicaemia. Outbreaks usually occur in poorer rural areas where animal health conditions are disregarded, with pigpens being dimly lit, damp and inadequately ventilated. During his visit, the Deputy Health Minister presided over the opening of a food poisoning prevention project undertaken to inform the general public of the risks of eating raw meat. He was welcomed by the director of Chormthong Hospital and over 1000 concerned local residents. The project will involve village volunteers, who will be monitored by local doctors and public health official. Replies and comments made during the Chiang Mai Mail’s interview with Pol. Col. Prayut Chommalee, the Superintendent at Chiang Mai Immigration, are, to ensure clarity and accuracy reported as recorded. Thank you, sir, for agreeing to this interview. First of all, we believe there has been a tightening up of the law regarding immigration – is this true – and to what extent? Yes, it is being tightened up, because of security and also to stop unwanted foreigners coming into and staying in the Kingdom. Last year, there were 18000 foreigners who applied to this office for visas; between 4500 and 5000 were short term visas. What do you think is the most common mistake foreigners make regarding immigration? The most common mistakes are regarding overstaying their visa, the fine for which is now 500 baht per day. Also, foreigner who is ‘long stay’ not reporting their accommodation; if a person does not live in a province that has an immigration office, they must report to their local police station. Landlords are also required to register foreigners staying in their premises within 24 hours. ‘Long stay’ foreigners must apply in person after the first 90 day period; however, afterwards they may send the form by post or with a third party taking the form to the Immigration office. It is the foreigners’ duty to report and identify themselves. Another mistake is regarding work permits; foreigners are not allowed to work whilst applying for their work permit. If they change employment, they must get a new work permit prior to working. The exception to this rule is if the company is BOI. Another usual mistake is when a consulate abroad issues a tourist visa for one year, they are still only allowed to stay a maximum of 90 days and this often causes misunderstanding. Then there are cases, when foreigners impregnate their Thai girl friends and apply to stay in the country; this has to be sanctioned and authorised by the courts. We believe two farangs were recently deported – could you make a comment? Although we cannot comment about individual cases, many foreigners come here on a tourist visa and work illegally. We investigate these cases thoroughly, sometimes over a long period of time, using various methods, including hidden cameras, to prove the person is working. Once we have the evidence we produce it to the courts. Most people who are deported go back home, change their name and gets a new passport; however with the new computer system and cameras we are able to catch them a lot easier doing this. What annoys you and your staff most when foreigners report to the Immigration Office? When foreigners come to the Immigration office and try to ‘control’ the situation, when they dress incorrectly, disrespectfully, (when going to a Government building everyone should wear long trousers and a proper shirt). Also shouting is not acceptable, along with using bad language. Quite often people write to this office, and some of the letters contain bad language, which we find unacceptable. How can foreigners help you to make your job easier, and to live in harmony with the local Thai population? Simply follow the law and obey the rules. If a foreigner is unsure of something, they should contact this office either in person or by phone 053 201 755 – 6 and get the correct information. A recent report from the British honorary consul in Pattaya states that the 90 day reporting requirement has changed. Apparently immigration now requires that people reporting need to show something with their name and address on it to prove where they live-such as an electricity bill. Does this apply to Chiang Mai, too? Different Immigration offices use different methods and techniques to successfully complete their duty. We do not, at present, require people to show prove of address when reporting every 90 days. Could the Immigration office let the paper know about any definite changes so that we can publish them? If you were to send it to [email protected], it would hopefully allow us to help you and save any unpleasantness. From next month people requiring extension visas will be required to have their picture taken by an official at the Immigration Office and also have fingerprints done at this office. This process may take longer, however it will enable us to complete our job more effectively. It will still cost 1900 baht. Work permits are now 3000 baht. We will be investigating ‘sickness notes’ issued by private hospitals more closely in the future. If an organization or institute sets up here in Chiang Mai, their foreign employees will be required to register in Chiang Mai instead of going to another immigration office or border control. We will endeavour to inform the local media and expat groups of various changes to the system in the future. One additional question if I may. Can foreigners, with or without a work permit, work or serve on a committee? Yes they may work on a committee; however, Immigration may keep an eye on them. Thank you for sparing the time to talk to the Chiang Mai Mail. This interview took place with the co-operation of Chiang Mai Mail and Chiang Mai Friends group. A meeting between Pol. Capt. Chalerm Yoobamrung, the Minister of the Interior, and members of the Northern Village Chiefs, the Village Headmen’s Association and district medical doctors from 17 northern provincial areas was held July 25 at Chiang Mai University. The aim of the meeting was to submit new procedural policies and to exchange knowledge and discuss problems, thus increasing unity between the organisations. Interior Minister Chalerm Yoobumrung, pictured speaking to the 2.973 attendees at the recent meeting. Speaking to the 2,973 attendees, Chalerm outlined three procedural policies. The first was suppression of narcotics use and dealing; local governors, village headmen and local administrative organisations were requested to upgrade their efforts to deal with the increasing trade in and use of narcotics. The second policy was aimed at controlling trespassing and the destruction of forests and natural resources. The third policy concerned the elimination of villager poverty, and outlined a scheme whereby any families with an annual income of less than 23,000 baht should be registered as impoverished by the village head man and their details passed on to the Director-General of the Provincial Division Department. This information, Chalerm said, will allow the government to proceed with assistance to the needy. It was also noted that entertainment venues will be examined twice-weekly for a period of 6 months by teams set up through the provincial governor’s office and the Social Organisation. To the delight and applause of the attendees, Chalerm announced that all village chiefs and headmen would receive an increase in wages. Village chiefs’ wages would increase from 5,000 baht to 10,000, village headmen’s from 3,000 to 8000. Assistant chiefs and headmen would receive 5,000 baht. Chalerm promised that, should the People’s Power Party be re-elected at the next election, all chiefs’ and headmen’s salaries would again be increased. Finally, he attacked the policies of the People’s Alliance for Democracy, saying that they should set up policies to oppose the PPP but that he thought they would have to wait for their next lives to be in power. Pictured here is the exchange between the two parties of the signed memorandum of cooperation. 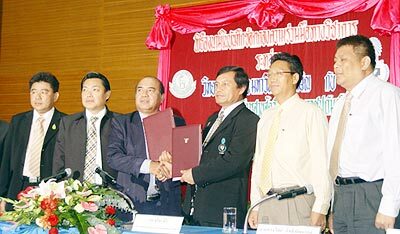 At a recent ceremony held at Chiang Mai Zoo’s Conference Hall on July 21, a technical and academic cooperation memorandum between the zoo’s organisational authorities and Thaksin University was signed, with the aim of developing a new management syllabus. Cooperation between the two parties will, it is hoped, help to develop personnel strategies, improve areas of responsibility and improve the imparting of knowledge to visitors and the general public. The Organisation of Chiang Mai Zoo, which is under Royal Patronage, lacks syllabuses relevant to the capacity to impart knowledge and conserve and protect rare species. It was announced at the ceremony that the premises of the Zoo Organisation can be used both for teaching and for developing associated businesses. Cooperation with the university should help to develop the knowledge and marketing abilities of the zoo’s personnel. The programme is being sponsored by the Chiang Mai Tourism Business Association. The Director of the Zoological Park Organization, (under Royal Patronage), Sophon Khamnui, stated that, in spite of ever increasing fuel prices and the falling economy, he expected that the Kingdom’s zoos would not be seriously affected as they provide an economical visitor destination with activities for families. A seminar for real estate developers and architectural students was held July 23 at the Imperial Mae Ping Hotel by the Department of Alternative Energy Development and Efficiency. More than 200 perticipants attended, including students from the Faculties of Architecture at CMU and Payap University. 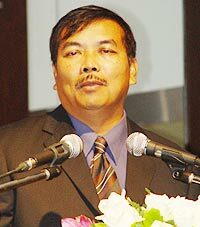 Pramoul Chanpong, director-general of the Department of Alternative Energy Development and Efficiency. Focusing on energy-saving house designs, Pramoul Chanpong, the department’s director general and a member of the working committee for the Best Energy Saving House Designs of 2008 project, gave a brief account of home electricity use in the Kingdom. He stated that household electricity consumption totals a quarter of the total electricity consumption in Thailand and pointed out that, as trend graphs are show an increase in the percentage, the design of energy-efficient homes is all-important. The government initiated and sponsored Best Energy Saving House Designs competition, held twice in 2007 and 2008, attracted 127 designs; in addition to the top award for the winning design, 10 designs received awards and 13 received complimentary awards. Architects from Chiang Mai itself carried off 4 of the awards. The project aims to encourage real estate developers and prospective purchasers to understand the importance of energy conservation. The Tourism Authority of Thailand has recently launched a new initiative entitled “Wonderful Thailand 2008”, aimed at high-spending Chinese visitors. A selection of the Chinese media have been invited to visit the Kingdom, and will be shown high-end tourist attractions in Bangkok, Phuket and Chiang Mai in the hope that the ensuing publicity in China will attract the right kind of affluent Chinese. The campaign is being supported by Thai Airways International and the TAT’s office in Beijing. The invited press will be treated to stays in 5-star Bangkok hotels, and will visit exclusive resorts in Chiang Mai and Phuket. Health tourism will also be promoted. TAT’s Governor, Mrs. Phornsiri Manoharn, stated that she is trying to eradicate low-priced package tourism from China, saying that “It might sound very controlled but we really need to maintain our standards.” She noted that the average spend on high-end package tours was 50,000 baht, and that visitors at that level spent more in Thailand and stayed longer. TAT is focusing more on nearby Asian markets as the rising cost of fuel has had an impact on long-haul tourism. Last year, over one million Chinese visited Thailand; to date during 2008, this market has shown yet more growth. TAT expects that, within the next three years, income generated from mainland Chinese visitors will be the major source of revenue for Thailand’s tourist trade. Soon-to-be ex-USA President George Bush’s two day stopover in Bangkok this week is being planned as an opportunity to meet with Burmese press and dissidents in the hope that it may lead to more pressure for change inside the beleaguered country. In a recent interview released yesterday by the White House, Bush referred positively to Aung San Suu Kyi, describing her as “as “a very heroic woman that was elected overwhelmingly by her people, and has now been under house arrest by a group of military guys that just simply won’t allow the will of the people to flourish.” He reiterated that he would meet with dissidents and the Burmese media whilst in Bangkok, saying “.”I will be speaking to activists to let them know that the United States of America hears their voices. And, you know, it’s a tough issue for some countries,” The meeting is likely to take place August 7 in the USA Ambassador to Thailand’s residence. The inhuman reaction of the ruling Burmese Junta to the ongoing disaster during and in the wake of Cyclone Nargis has strengthened the opposition of the human rights community; when asked about the failure of a sanctions-led US project aimed at putting pressure on the generals, the President replied that the main reason for its lack of success was the refusal by certain other countries to adopt a similar stance..“ The idea of unilateral sanctions, they’re effective only to a certain extent. And, therefore, other countries must also join, and, frankly, there’s some countries in the neighborhood that aren’t interested in joining,” explained Bush. South East Asia’s ten ASEAN countries, (and particularly Thailand, whose PMN Samak Sundaravej has been quoted as saying that the way to Burmese democracy is through trade and support), have consistently refused to consider effective sanctions, stating that they prefer a policy of engagement. Earlier this year, Thailand’s PTT Exploration and Production formed an economic partnership with Naypyitaw, the new Burmese capital build to house the Junta generals and their cohorts. The partnership relates to the M9 gas field development; 80% of its natural gas production is to be exported to Thailand. Whilst her husband is occupied by matters of state, Laura Bush, who has been a strong supporter of Aung San Suu Kyi for some 5 years, is planning a trip to the Thai/Burmese border. The couple are due to arrive in Thailand August 6, on their way to the Beijing Olympics, which will begin on the 20th anniversary of an uprising in Burma which resulted in the deaths of more than 3,000 civilians. Pol. Cpl. Rak Kamnasak (34), of the Highway Traffic Control Center 2 in Bangkok, was shot dead by Chiang Mai Muang district police officers on July 24 during a raid on a Chiang Mai house. Information had previously been received that a property in Grand View Village had been identified as the base for distribution of pornographic CDs and amphetamines. When officers arrived at the house with a search warrant, Rak took his gun and fled, pursued by the officers. During the chase, he fired at the officers, who returned his fire, resulting in his being shot four times. He died at the scene. A pistol and spent bullets were found next to his corpse; 11,020 baht, 7 ATM and credit cards and two ID cards were found in his clothing. A police officer was shot in the thigh during the chase. A search of the leased property revealed a vehicle, 3 computers, 3000 CDs, 50 YaBa pills, 2 M16 bullets, gambling equipment and a list of several customers’ names. All were confiscated to be used as evidence. The dead man had, according to reports, been selling illegal CDs in the Night Market and along the Thai/Myanmar border in Chiang Saen, and had been leasing the Grand View Village house for approximately one year in order to use it as a headquarters for his illegal operations. A recently discovered illegal Arabica coffee plantation of 32,000 bushes spread over 100 rai of land in Doi Luang National Park, Phayao province, have been destroyed by officials from the National Parks, Wildlife and Plants Department, the Military, the police, and members of the Border Patrol. Local administrators and villagers from the area joined in, making the numbers up to approximately 700. Also destroyed were a large number of persimmons, pomelos, plums, 10 huts and 12 coffee drying areas. A cabinet resolution drafted in 1992 to protect the National Park areas had forced the relocation outside the park of 11 hill tribe villages. At the time, it was reported that the relocated residents were to be reimbursed for damage done and helped to find new occupations outside the park. However, it would seem that some members of the Thai hill tribe had begun to illegally plant coffee bushes inside the boundaries of the park. The owners of the plantation had been given 30 days by officials to remove the bushes, but had failed to do so. Withoon Rermwiwat, the Director of the Administration for the Preservation of Zone 15 in Chiang Rai, stated that the destruction of the crop was necessary to prevent further trespassing on National Forest land and to aid in the prosecution of the owner of the plantation. Protection of the immediate area of the forest against further encroachment and illegal use was necessary, Withoon added, as it forms a watershed between the Yom and Chaophraya rivers. The area will be cleaned up again within several weeks, to present merit to Her Majesty the Queen on Mothers’ Day, August 12. Charges have been filed by the Chiang Mai Alliance for Democracy against the Chiang Mai Alliance against the Alliance for Democracy concerning incidents which took place at a recent CMAD-organised seminar. Leaders of the Chiang Mai Alliance for Democracy, led by Surayan Thongnuiad, met with Pol. Lt. Col. Piyabutr Achariyamonkol, superintendent of Chiang Phuak police station, on July 22. Requests made included fair treatment, measures to guarantee the safety of the public in executing their rights under the constitution and the investigation of those responsible for the assault and damage to property which occurred during the seminar at Ban Son Gymnasium. Almost 3,000 people had attended the seminar, which was disrupted by a crowd of 500 Alliance against the Alliance supporters. Reports stated that missiles were thrown at the audience, causing injury; those injured were afraid to press charges for fear of reprisals. Pol. Lt. Col. Piyabutr requested film of the event and will question members of the press who were present. A task force will be set up to find those responsible for the violence. Reiterating that it is up to the Thai government as to when troops might be withdrawn from the disputed Preah Vihear temple site claimed by both Thailand and Cambodia, Foreign Minister Tej Bunnag said Thursday the Cambodian government has “not informed Thailand officially” when it will pull out its troops from the area. According to Tej, it is not necessary for the Thai government to react because the Cambodian government has not shown any sign that it would withdraw its troops from the disputed area. .
Cambodian Prime Minister Hun Sen said in Phnom Penh on Tuesday that Cambodian troops were ready to withdraw from the 4.6-square-kilometre disputed area adjacent to the 11th century temple, and indicated that the timing of the troop withdrawal is up to Thailand to decide, as it is not a problem for Cambodia. Meanwhile, senior Thai officials held a workshop last Thursday at the National Security Council, during which one major topic of discussion was expected to focus on the agreements made by the foreign ministers of the two countries on July 25 in Cambodia’s Siem Reap province. Thai and Cambodian foreign ministers both called for the redeployment of troops in and around the new pagoda located in the temple complex, so that a meeting of the Joint Boundary Commission could be held to demarcate the border line, to clear landmines around the ancient temple, and to avoid armed confrontation.